This is the swing that did it. I proved that Mammoth Dunes’ No. 14 is indeed a drivable par-4. I accept the premise that if you have one 18-holer you have a golf course, but if you have two - or more - you have a golf destination. Well, Sand Valley is definitely a golf destination now. This Mike Keiser-developed facility in Central Wisconsin opened its first course on May 2, 2017. Designed by the widely respected architectural team of Bill Coore and Ben Crenshaw, that course was called simply Sand Valley. It was well received, of course. Keiser, though, always planned to have more than one course here. So, preview play was permitted at the second course, Mammoth Dunes, late in the 2017 season and the David McLay Kidd design opened officially this year. 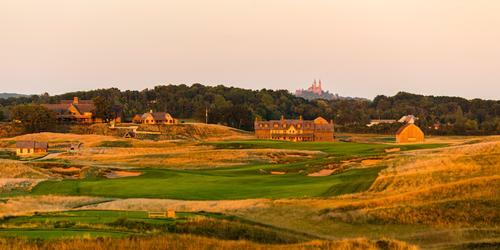 So did The Sand Box, a 17-hole par-3 course that was already the site of Sand Valley's first significant competition. 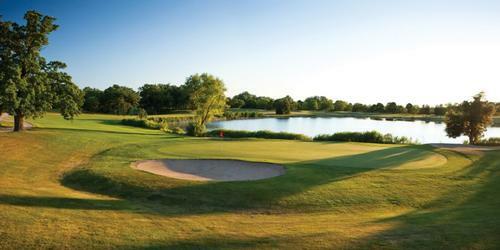 The Wisconsin State Par-3 Championship was held there in July. The Sand Box is also a Coore-Crenshaw design with Jimmy Craig also on the credit line. Mammoth Dunes, though, is the course which took Sand Valley to destination status, like Keiser's other American projects Bandon Dunes in Oregon and Streamsong in Florida. They're all walking-only facilities but in very different parts of the country. As far as overall atmosphere goes, Sand Valley is much more like Bandon than it is like Streamsong. 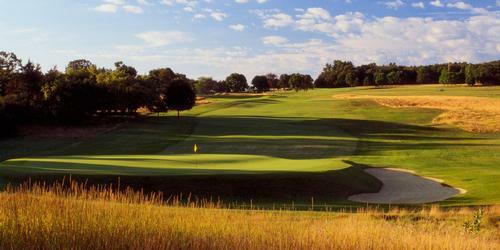 Lots of Amerian golf destinations offer a variety of courses, and we've been blessed to experience many of them. Bandon, with its four courses and a 13-hole par-3 layout, is clearly the best golf resort in America from this perspective. Sand Valley is still in its fledgling stage and might get there eventually. For now, though, this focus is on Mammoth Dunes which - I'm comfortable in declaring - the most fun golf course I've ever played. And that's saying a lot. There are a lot of fun courses out there. More than anything golf is supposed to be fun. 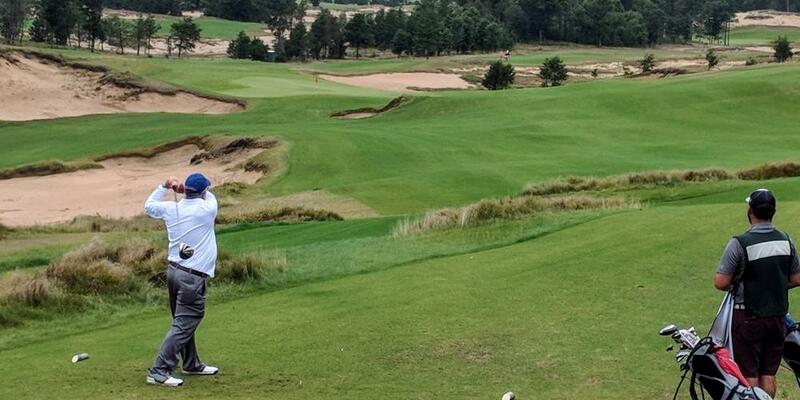 Mammoth Dunes is that - and it would be even when your golf ball isn't always going in the "right' direction. David McLay Kidd is a Scottish architect who designed the first course at Bandon Dunes 20 years ago. At Mammoth the fairways are wide and the greens are huge. No. 18 at Mammoth has the largest putting surface on the property - nearly a half-acre. Though water barely comes into play on any of the 36 holes, the fairways and greens on both courses are filled with bumps and mounds and impacted by bunkers and hazards that stimulate your thinking. You don't lose many golf balls, though. The course has a bonafide drivable par-4 hole. Many "drivable par-4s' don't deserve that description. They're that for only the select long-ball hitters, but I know Mammoth Dunes' No. 14 fits the bill. I drove the green from the white tee, 261 yards with a strong helping wind and a downhill path to the putting surface. It'd been over 20 years since I'd driven a par-4, so it was quite a thrill even though a three-putt followed. But I digress. This hole has an interesting history and Kidd doesn't get all the credit for it. Brian Silvernail gets partial credit. A Florida resident, he won Golf Digest's Armchair Architect contest in 2016 and Kidd incorporated his design of this hole into the Mammoth Dunes rotation. One thing that's a must when you play Mammoth Dunes - at least for the first time - is a good caddie and, in local guy Luke Jackson, we had the best. A bag-toter is desirable for more than just making the seven-mile hike less of a physical challenge. A lot of shots aren't what they might first appear at Mammoth Dunes. Go with your gut and you're sure to get burned. Take an experienced caddie and you'll do much better. Either way, though, you'll enjoy the Mammoth experience. It was impressive to see how far Sand Valley has come in the three years since we hiked the sandy hills with Michael Keiser Jr, Mike's son, prior to the resort's opening. The first course, Sand Valley, is more challenging than Mammoth Dunes. Mammoth - at 6,988 yards from the tips - is an insignificant 50 yards longer, but both are par-73 layouts. The fifth hole on Sand Valley was built at the highest point on the property. It's not the toughest short hole on the property, though. That label easily goes to Sand Valley's 17th, which presents an uphill blind tee shot to a green 236 yards away from the back tee. None of the 10 par-5s on the property play as long as Sand Valley's fourth - 593 yards from the tips. For those into numerical comparisons Sand Valley tops off at a 73.2 rating with a 134 slope. For Mammoth it's 72.4 and 132. The rap on Sand Valley is the shortage of lodging. Wisconsin, as a state, isn't long on chain hotels, either. More lodging is being built in and around Sand Valley to fill the need and the town of Wisconsin Rapids, a 20-minute drive away, has a variety of options. We used Hotel Mead there and the dining options are more numerous there as well. Wisconsin is known for its supper clubs and fish fries, and we found the Branding Iron in Wisconsin Rapids provides a great flavor of the area. The resort has an upscale dining room and more informal pub and non-golfing locals like to hang out around Sand Valley's snack bar to watch the golfers tee off and finish their rounds. That fun setting complements the players' enjoyment on the course. Now, I don't put much stock in the course ratings published annually by the various golf publications. In this case, though, it's worth mentioning that Sand Valley was Golf Digest's Best New Course of 2017 and Golf Magazine labeled it Best New Course You Can Play. That's lofty praise, and Mammoth Dunes should be a lock for the same honors in 2018.